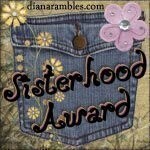 I’m accepting this sisterhood badge from Kasai of My Simple Life with all my heart, this is the second award for this blog and as always very well appreciated. When I first started blogging I wasn’t expecting to be gaining lots of friends around here. Thanks to all of you who have believed in me. And to Kasai, thank you for sharing this award to me.